The American Visionary Art Museum has been one of our favorite venues for many years. Sure, there’s a family connection. (The founder of the museum is my grandfather’s cousin’s ex-wife, and my grandfather’s cousin was instrumental in getting the museum built and opened.) But there’s so much more than that, that keeps this place close to my heart. The first Hoffberger Family event held at AVAM was my great-aunt’s 85th birthday party. Just an intimate gathering with about 300 of her closest friends and family members. 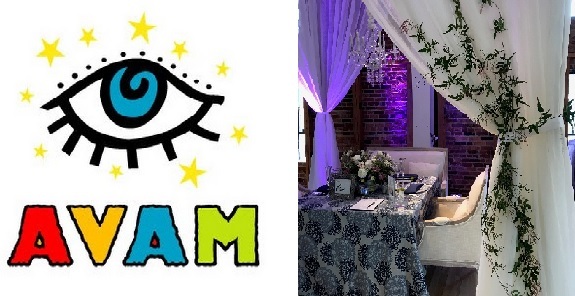 Another family event took place there a few years later, and Plan It Perfect has planned and coordinated scores of events there over the past 14 years in business, and we are so grateful for every opportunity to continue working at AVAM. 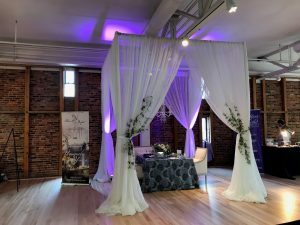 Each year, AVAM hosts a Wedding Happy Hour event, open to the public, including all of their own contracted and prospective clients. Plan It Perfect has been invited to attend every year, and it’s been an exciting challenge to figure out what our display is going to look like each time. The attendees are different every time, so we could probably get away with doing the same kind of thing year after year. But what fun would that be for us? This year, we really had to raise the bar and draw attention to our display. So, we went UP! A tall cabana with a crystal chandelier drew everyone to the back of the room where they could find us. 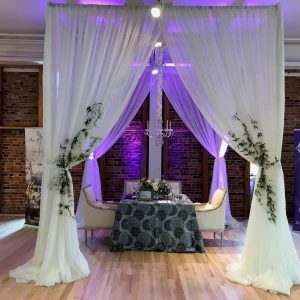 Our good friends at Fabrication Events executed our vision of a romantic cabana, complete with fully-operational chandelier. They also provided their brand new soft seating, the Edgewood Love Seat and Armchairs. 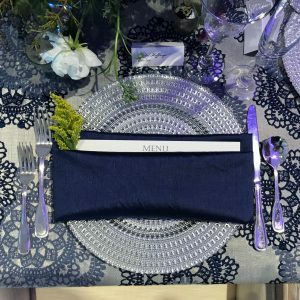 Select Event Group is our go-to for all things linens and tableware. 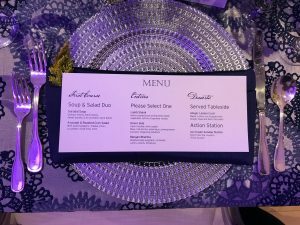 They generously provided the Big Lace Blue linen, the silver rimmed glassware, the silver flatware, Tripoli base plate, and shantung napkin. 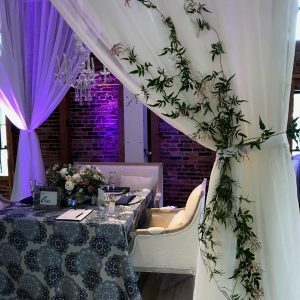 Our floral partner extraordinaire, Crimson & Clover Floral Design, created the centerpiece for the table, and executed our vision of the romantic greenery climbing the cabana. The Plan It Perfect team had a fun time selecting every detail of the display, right down to the stationery. We designed and printed in-house a simple stationery suite on white card stock with navy blue print. It’s always been a fun little easter egg of mine to use names of people who are important to me on the place cards, to pay homage to their impact on my life. So this table of four was set for myself and my beloved boyfriend Binda, along with my assistant Anastasia and her partner Mariela. Another fun stationery detail was the menu. The menu items consisted of some of my favorite things at our affiliate restaurant, Ananda. But the best part was the layout. We knew we wanted to wrap the napkin around the base plate, horizontally. And we also wanted to tuck the menu card in. But that meant we needed a horizontal orientation for the menu. We hadn’t ever seen that done before. So we made it happen! We are pretty much in love with this idea and we can’t wait to see future couples implement this simple, but innovative idea. Our favorite part of the event was meeting all the couples. AVAM tends to draw in a diverse group of people, ranging from art enthusiasts, to traditional couple who need a large event space, to quirky couples who want something fun and funky. What a joy to talk with each couple and learn what it is about them that makes them love the AVAM as much as we do. 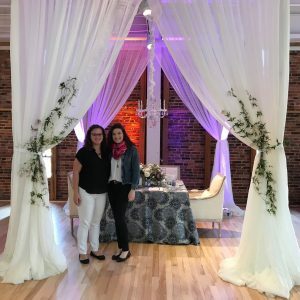 If you would like us to plan your event at The American Visionary Art Museum, or anywhere for that matter, please contact us for a complimentary consultation!